So I came back one night for dinner to try it. 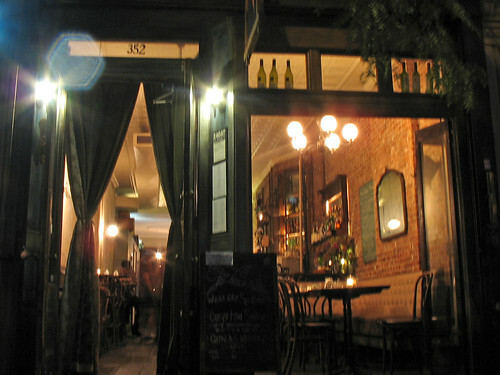 The place was just as cozy inside as it had appeared from the outside. A group of people who obviously knew the bartender were all seated around the bar having a jovial evening. After he took my order, the bartender even gave me a leftover cookie since it was the end of the day and they were going to be throwing out all the unsold pastries. He told me they did all their baking downstairs in the basement – and the bun that my house-made black bean burger would be served on was homemade too! But this is by far the best black bean burger I have ever had. 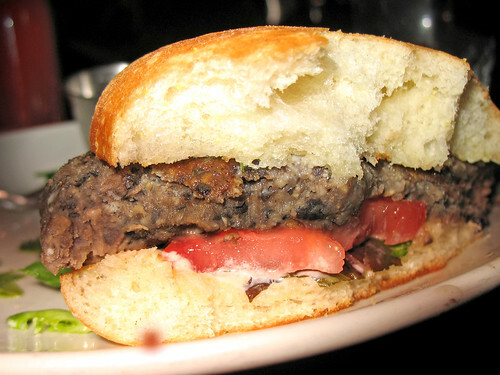 Not the best burger overall, but if there were a category for black bean burgers alone, this would take top honors! The patty was thick and moist and flavorful – it held together well, too, which was most impressive given its size and consistency. I think there were some other vegetables ground up in it with the beans too, but the beans were definitely the dominant flavor. It was topped with lettuce, tomato, pickled vegetables and garlic dill aoli. 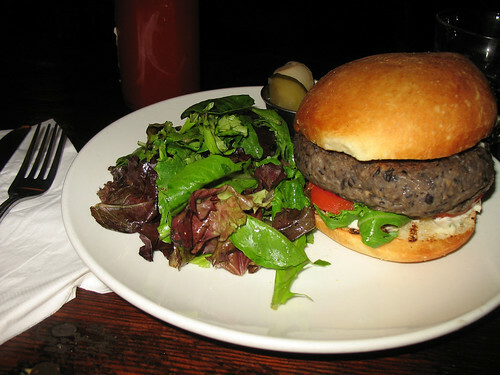 And the bun was delicious – true to what the bartender had said, it definitely tasted like it was made in a bakery! Sweet and light and fluffy – like a pastry.